An Overnight to the North of Ireland, Belfast City including an overnight in the Heart of Belfast City Centre which includes the famous 'The Ulster Fry' breakfast. You have the evening free to explore the vibrant city of Belfast. Day two you will visit Irelands top tourist attraction the Giants Causeway which has often been described as the Eighth Wonder of the World. This is a fascinating day out to the famed Antrim coast with its spectacular seascapes taking in the Giant's Causeway and Dunluce Castle. Sleep in and overnight in Belfast City and full-day tour to the Giant's Causeway. 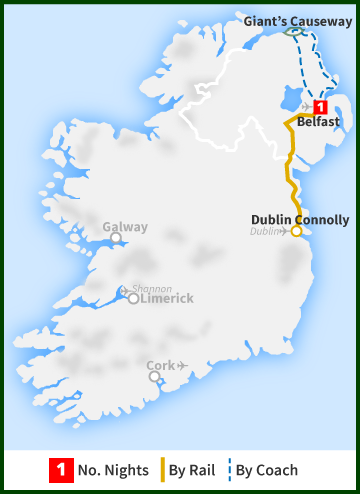 An overnight to the North of Ireland, Belfast City including an overnight in the Heart of Belfast City Centre which includes the famous 'The Ulster Fry' breakfast. You have the evening free to explore the vibrant city of Belfast. Day two you will visit Ireland's top tourist attraction the Giants Causeway which has often been described as the Eighth Wonder of the World. This is a fascinating day out to the famed Antrim coast with its spectacular seascapes taking in the Giant's Causeway and Dunluce Castle. Check-in is 20 minutes prior to train departure time at the customer service desk at Connelly Station where our check-in representative will be in their yellow jacket! 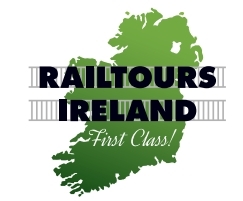 Check in for 1:20 pm departure from Connolly Station (please check in 20 minutes prior to departure). On arrival in Belfast Central Station we will transfer to a local train service to Belfast Great Victoria Street which is situated directly underneath your 4 * standard Hotel. The rest of the afternoon is free to explore the exciting Northern Capital. Overnight Stay: Belfast City Center. Enjoy a Full Irish Breakfast at your leisure. 9:30 am pick up from your hotel. Leaving Belfast we proceed to the town of Carrickfergus for a short photo stop and take the coast road north from here. Further north we arrive at the fishing village of Carnlough, where we stop for about 15 minutes. We continue on passing the coastal villages of Glenariff, Cushendall and Cushendun. There are stunning views of the sea to the right and the mountains or the Glens of Antrim to the left; you can even glimpse the Scottish coast on a clear day. Lunch stop is at Bushmills Distillery - lunch is not included and a tour of the distillery is not possible due to time restrictions. Our next stop is the famous Carrick-a-Rede Rope Bridge. Traditionally fishermen erected the bridge to Carrick-a-Rede Island over a 23m-deep and 20m-wide chasm to check their salmon nets. Today visitors are drawn here simply to take the rope bridge challenge! We then head for Dunluce Castle for a photo stop before arriving at the Giant's Causeway, a UNESCO World Heritage site, where we stop for about 2 hours. Leaving the Giant's Causeway, we head back to Belfast to return to Dublin. Returning to Dublin Connolly Station at 10:15 pm.